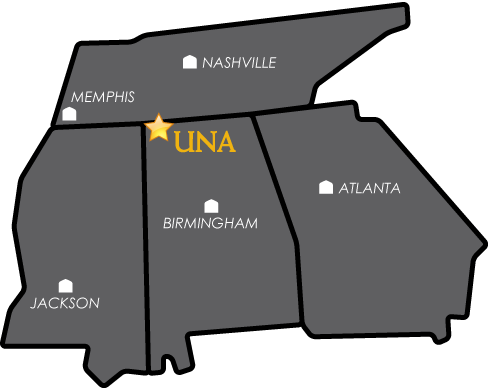 Once you have completed the necessary application for your branch of service, print of a copy of the confirmation notification and bring it to the UNA business office - Ms. Aleah P. Clark, Bursar, Student Accounts - apclark@una.edu ph: 256.765.4441 UNA Box 5001 26 Bibb Graves Hall Florence, AL 35632-0001. She will then make sure that your FTA confirmation is noted on your account to keep your schedule from being voided due to non-payment. Ms. Clark also handles Alabama GI Dependent Scholarship. US Coast Guard - The management of TA is centralized at the USCG Institute through a consolidated tuition assistance processing system managed by the U.S. Naval Education and Training Professional Development and Technology Center (NETPDTC) in Pensacola, Florida. The Coast Guard Institute approves the TA Application (CG-4147) , inputs data into the Navy's computer database, and issues the TA Authorization form (CGI-1560). The applicant then takes the CGI-1560 to the academic institution during registration; the institution bills the Navy (NETPDTC) for payment of the government's share of tuition assistance. Alabama GI Dependent Scholarship Guidelines form.